Love to doodle? The Chalkboard paper pad has a wonderful, hand drawn edge that will give your pretty makes a youthful and quirky edge! From bright and bubbly designs to enchanting papers, the Simply Creative paper pads collection really has something for everyone! The Sweet Dreams papers will help you create the prettiest projects with its’ night skies, dream catchers and feathers designs. Country Garden is just as beautiful with its' portrayal of nature including delicate patterns of bees, florals, feather and butterflies. This paper pad is elegant, on-trend and will look fab on your projects, all year round. Don’t worry, we’ve also kept men in mind too with our Around the World paper pad. Filled to the brim with adventurous designs, the dynamic colour palette alongside the geometric and wanderlust illustrations will help you create a craft they would love to receive. 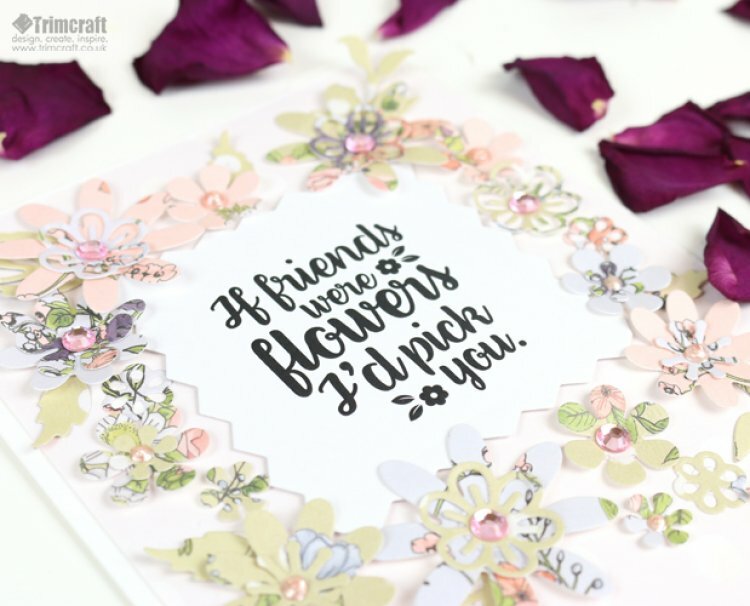 A few of the sentiments featured in this article are from our incredible value, Dovecraft Sentiment Clear Stamps collection. Pricing at only 99p per stamp, this varied selection will help you leave the perfect message on your handmade project. Featuring beautiful typography and phrases, this selection of stamps is definitely worth collecting! Keep your eyes peeled, these fab collections will be in shops later this month! Remember to keep uploading your crafts to the project gallery and when uploading to social media, to #trimcraft.